Hello darlings! Where did the time go? September already and 3 weeks until end of summer and the end of the 3rd round of ROW80. The writing is going....well...fine, progressing, but slowly. We just spent the week at one of the most beautiful spots, so peaceful, so quiet, you couldn't help but be inspired. I realized why the writing is going a bit slowly. You see, I hadn't outlined the rest of the story. I had up to a certain point, but then forgot about outlining the rest. I basically know how the story is going to end but getting to the end, writing the end is the problem. So since my husband and I brainstormed, I'm going to finish outlining the rest of the story this week, then my goal for the next 3 weeks will be to get er dun. Also included in my goals this week will be to finish outlining the rest of our 6th grade curriculum since lessons are officially starting September 12. 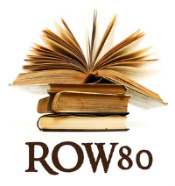 To see how the rest of the row80 gang is doing, go here and make sure to leave a note of encouragement. During our vacation, we had plenty of time to read. At some point during August I picked up Laurell K. Hamilton's Guilty Pleasure's, the first book in her Anita Blake Vampire series. I thoroughly enjoyed it and downloaded the 2nd, then the 3rd, and well you get it. I am addicted to the series and am currently on book # 14 Danse Macbre. Why am I addicted to the series? Is it the writing, the characters, the storyline. It seems to be all three. The writing is compelling, the characters interesting and the storyline changes often enough to keep you hooked. Because I've been reading one after another, I can see the growth of the characters and how it all fits in with the story. I've read plenty of reviews and complaints about the sexual turn in the storyline, but it all fits. I think what most people forget is that Anita isn't exactly human and they keep trying to attribute human traits to her. Yes, the storyline started out almost more horror like in aspect and was pretty gruesome, but as she grew in her powers, she changed. Unfortunately for some people, the sexual aspects of the story turn them off. I don't have a problem with it, obviously, or would stop reading the series. Laurell K. Hamilton is another writer to add to my list of writers to watch. Not to emulate, because I doubt I could ever write a paranormal or something so sexual, but to learn from. What's next on the nightstand? Thanks to Cherry Adair, her latest "Riptide" and Karen Rose's "You Belong to Me" which I started on the airplane coming home. Otherwise I'll let you all choose something for me to read next from my long list. Choose one or click on the random link and generate a number between 1 and 122. I'll add it to my to be read next list. What's on your nightstand this month? sounds like a great place to relax - a vague outline is usually a good idea! although i dont always know where my characters are going - the end often comes when I'm half way through the book!! Oh don't remind how the summer flew -- argh! Looks like you had a great vacation. I always have vague outlines...I like to leave myself room to change things up. Well, I guess that one could do that anyway...but I don't like feeling boxed in. Sounds like you had a wonderful place to write, contemplate, etc. I always write up an outline, but I also ALWAYS change it as I go along. Still, it helps to know where I intended to go just in case I get lost - LOL. Good luck on your goals. Oh, and my nightstand has "The Doctor's Lady" a new release by Jody Hedlund.